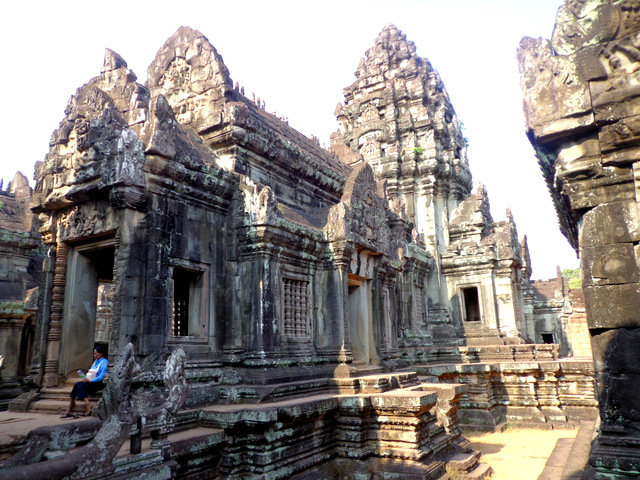 On Day One, we visited Angkor Wat (at sunrise), The Bayon and Ta Prohm. To relive our account, click here. On Day Two, we ventured a bit further. A lot of tourists seem to skip Banteay Srei because of its distance from the rest of the circuit or simply because of time constraints. I, myself, was not sure whether it was worth visiting when Mr. Tha-Ro, our chauffeur, suggested it. But one search on the internet and I was hooked. Banteay Srei may be small in size but it’s packed with a lot of punch. 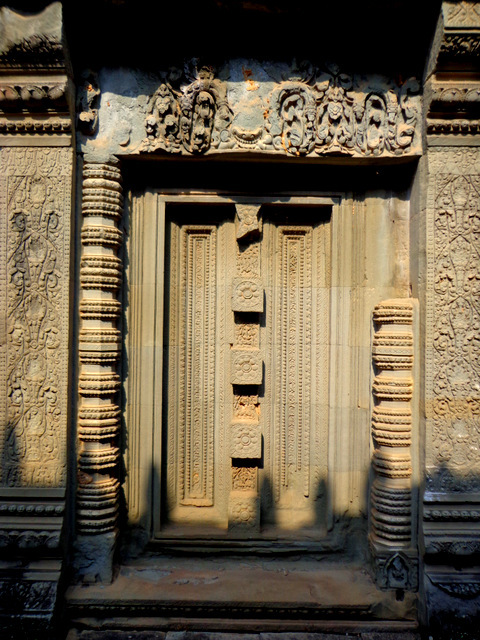 It’s the ultimate in Khmer architecture. The place is beautifully kept with paddy fields and tiny bridges and souvenir shops. We reached there at 7am and I’m so proud to tell you that we were the first to arrive! That meant having the entire complex to ourselves with no annoying tourists. 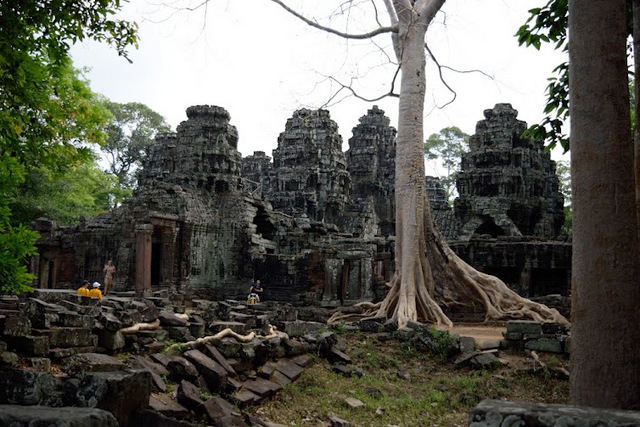 Believe me, in Angkor Wat, it’s a different high altogether to be left alone with the temples. 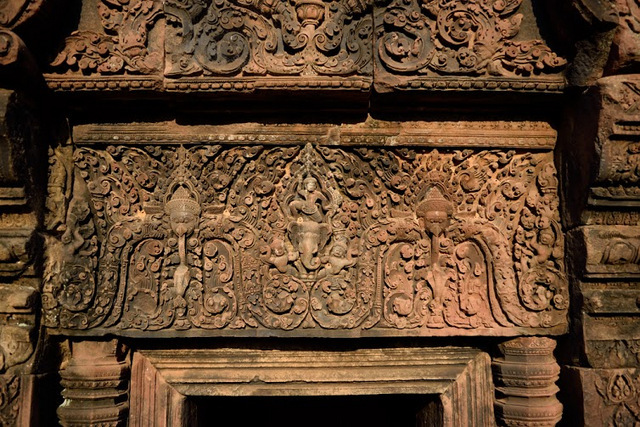 This temple, Banteay Srei, has really intricate, delicate work. The guide lets you venture inside the main complex if you pay him a tip. But our friend who went inside said it wasn’t that awe-struckingly awesome. So even if you don’t get to enter the main complex, don’t be sad. There’s enough to make you happy. But if you can, go early in the morning like we did. It’s quite magical at that time. 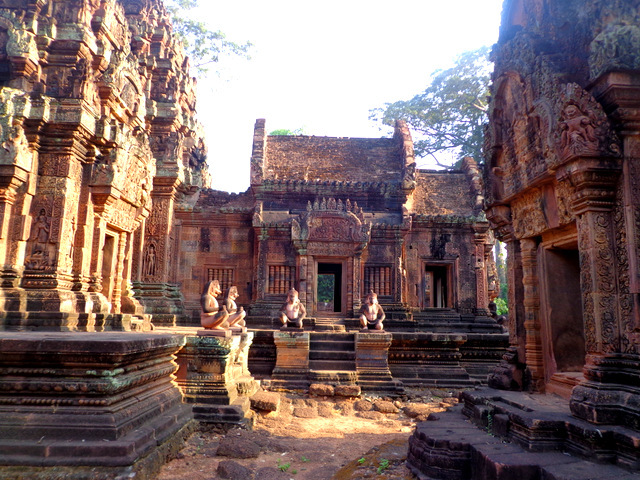 After Banteay Srei, we visited Banteay Samre. This one quickly climbed to the top of my favourites. There are multiple structures, one after the other; it’s like a door leading to another and then another… It must have been the possibility of doors after doors that made me like this structure. Btw, I also bought paintings from one of the vendors outside this place. It wasn’t a heavy painting. Just simple Khmer houses on stilts done in different shades of a color with a minimalist touch. The painter himself was selling the pieces and we bought two beautiful acrylic pieces for $8. We also had cold noodle soup with cucumber, raw papaya and cabbages. Sounds odd? It tastes good though. After this, we went to Preah Rup. 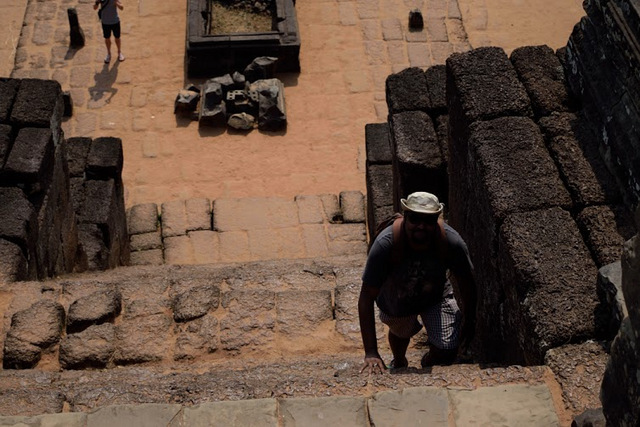 In the heat, the climb looked excruciating. It wasn’t a tough climb; just that the sun pounding at your head and back makes you want to loll your tongue on the nearest shaded stone. But once you are at the top, you do feel a certain “high”, literally and figuratively! Don’t stress yourself but if you can, do climb to the top. You will love the breeze and the 360 degree view. Here, I bought TWO lovely cotton-silk stoles (with Angkor Wat in gold thread work) for $3. My best purchase of this trip! 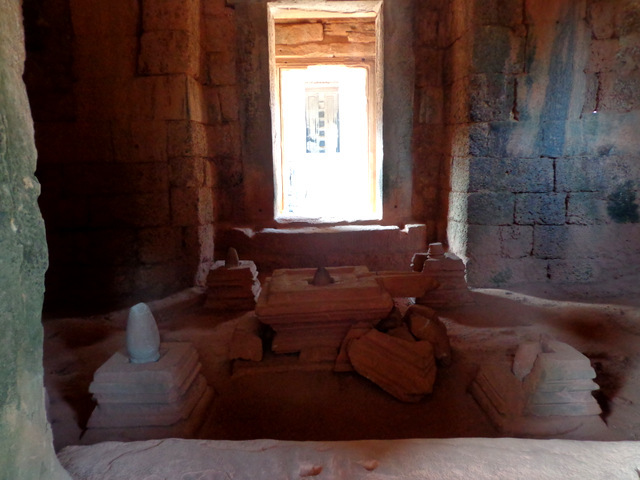 The next stop was Banteay Kdei. 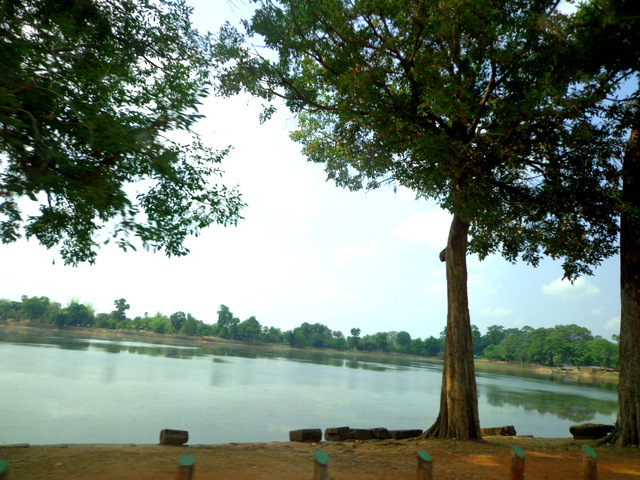 While going from Preah Rup to Banteay Kdei, we passed by Srah Srang but didn’t stop there. Now Banteay Kdei is really long… and I mean it… the complex is a rectangular one that took us a full minute to pass by car. On foot, it took us quite some time to walk through the complex. And we just walked through with a few photos here and there. If you were exploring this place, it would take you 1-2 hours. This place was also quite beautiful. In fact, by the end of the two-day trip, I couldn’t decide which was NOT my favourite (since every one appeared to be my favourite). 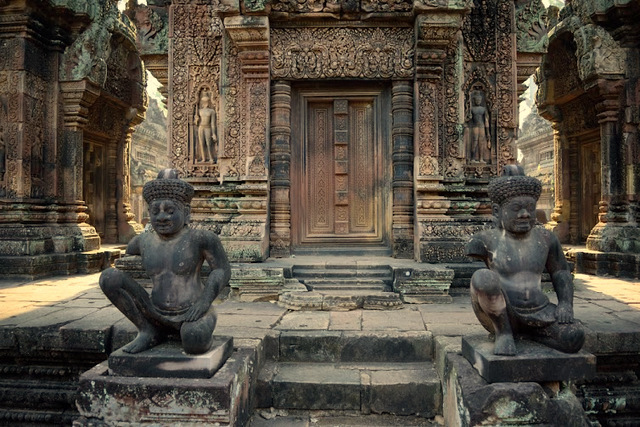 Nonetheless, I am particularly partial to Banteay Samre, the Bayon and Banteay Srei… for no reason at all. I am sure you will be in a dilemma too if you visit these lovely places. It’s best to not try choosing a favourite! Don’t go to tourist-frequented cafés. They will charge you $3 for a coffee. Negotiate with humility, with a lot of “sorry”s thrown in between to let them know you don’t mean to offend. They usually negotiate politely and well. For the paintings, I used sign language to indicate that I’m short on cash, the painter and I had a good laugh and we fixed our prices. If you find something like a $1.5 stole, BUY IT! The Angkor Night market was selling the same goods for triple the price! Found something odd but interesting to eat, well… eat it! For me, I learnt that raw papaya, cucumber, cabbages and cold rice vermicelli with a seafood sauce makes an awesome combo! How we went overland from Bangkok to Siem Reap? Answered here! 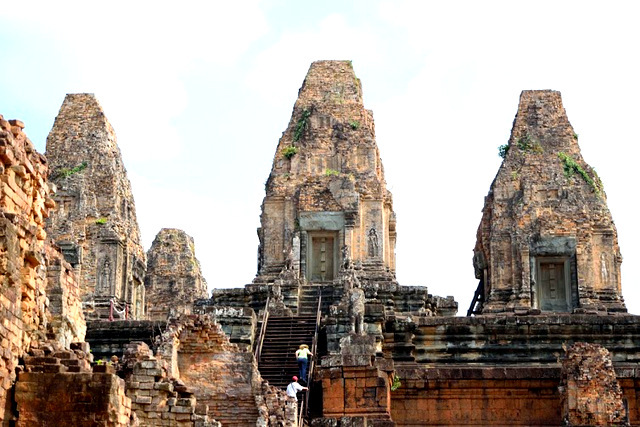 For Day One of the Angkor temple-hopping, click here! For more on the food we ate in Khmer Empire and Bangkok, read on! What to do in Bangkok when it’s burning hot and you have nowhere particular to go? Well… This is what we did!